“Three Lions on the shirt, Jules Rimet still gleaming,” sang Baddiel And Skinner in 1996 (wow, how long ago does that seem now?) as they cheered the England football team on to the dizzy heights of, ahem, a semi-final penalties defeat against Germany at Euro 1996. While the glory days of England footie teams are sadly few and far between (and if you’re reading this in Scotland, stop sniggering now) but with the World Cup about to arrive in Brazil, what better way to get in the mood than with 3 Lions on your tablet? A 5 reel, 20 payline slot from developer Blueprint Gaming. The crisp, clean graphics of the online version have made a seamless transition over to its mobile cousin. In fact, this is a great little gambling game to play when you’re in the pub watching Wayne Rooney’s desperate attempts to get himself in the game next summer (and if you’re reading this in Scotland...etc).Blueprint’s user-friendly touchscreen buttons have a massive Autoplay and Spin button down the right-hand side, with a handy button to adjust your betting limits without leaving the game screen. The England supporters’ trumpeter is present and correct on the reels as you spin, tooting away with another poor rendition of The Great Escape as you line up winning combos. The icons here include the classic Three Lions emblem, a football, Golden Boots, the brass ‘band’, and 9-through-Ace symbols that are cleverly shown as football shirt numbers. The Wild is the fan with the cross of St. George emblazoned across his face, and he substitutes for all regular symbols other than the bonuses. Five Wilds pays a $5,000 jackpot. Earn up to 50 Free Spins! 5-50 free spins can be won in the first bonus game, activated if you hit three or more Bonus football icons anywhere. First you’ll pick a shirt to determine your spins, and during the round the reels will be stuffed with extra Wilds and Scatters to give you a better chance of winning. Three or more Trophy Scatters across the reels will trigger a nice Trail Bonus called Road to the Final. Spin dice to work your way around the board and win cash; collect three trophies to qualify for the Cup Final and go for a 500x total bet jackpot. Finally, the fans get a look-in with the Fanzone Bonus. Three or more WAG icons on the reels triggers a fairly straightforward Pick ‘em Bonus – simply pick a girl from the line-up to reveal a cash prize. Again, you can win up to 500x your total bet in this bonus round. 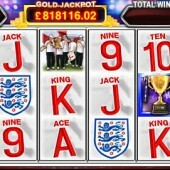 There’s a nice gold jackpot to be had in the game and it can be won three ways: collect three golden balls during the Road to the Final bonus, accumulate five golden balls during free spins, or reveal a golden card during the Fanzone Bonus. Hit the jackpot and $100,000 will be yours. 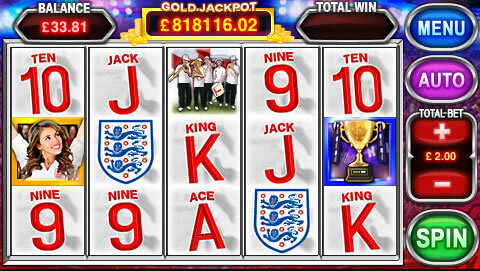 This is a mobile slot that will get you right in the mood for the football any time of the year, regardless of your allegiance. It’s good to see some sports-themed slots hitting tablets, and if this has got you in the mood, check out Play'n Go’s football-themed Golden Goal slot, while the golf-themed sports slot, Gold Trophy 2, also from Play'n Go, is definitely worth a spin.